The main item you’ll need for this tutorial is your cold biscuit leftovers. You can use biscuits cold from the fridge, freezer, or room temperature. 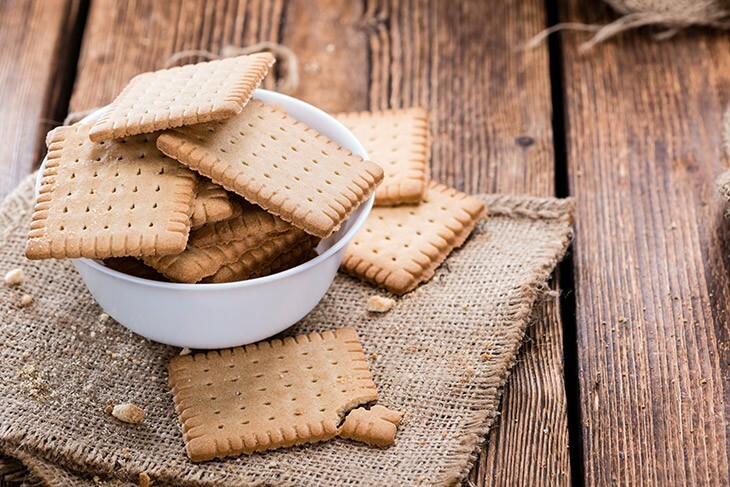 To store biscuit leftovers, keep them in an airtight container. Biscuits are a type of bread leavened with baking soda or powder. They’re light and fluffy, perfect for breakfast with bacon or eggs. The exterior is slightly crispy and golden brown. To give moisture and flavor, consider glazing the biscuits with melted butter like you do in a pizzelle. You can melt the butter by heating it in the microwave on medium-low power for 10-15 seconds. Another way is to melt butter in a heavy saucepan or double boiler. If you don’t know how to melt butter, watch this video. Alternatively, you can use olive oil instead of butter. For a more savory taste, try using some bacon grease. You’ll need a pastry brush when you glaze the biscuits or cookies with the butter, olive oil, or bacon grease. Although you can do it with your bare hands, it can be a bit messy. If you have no pastry brush, you can use some paper towels, an unused paint brush, or cheesecloth. A baking sheet will serve as the place where you’ll lay your biscuits in the oven. You can use different types of baking sheet, but for even heating, use aluminum, like this one. This type of material conducts heat very well, plus cleanup is super easy. To prevent your biscuits from sticking to the baking sheet’s surface, use parchment paper. This material will create a non-stick surface and makes it easy to release the biscuits without breaking. Since no biscuits stick into the pans, it aids for easy cleanup. Begin, by preheating the oven to 350 degrees Fahrenheit. 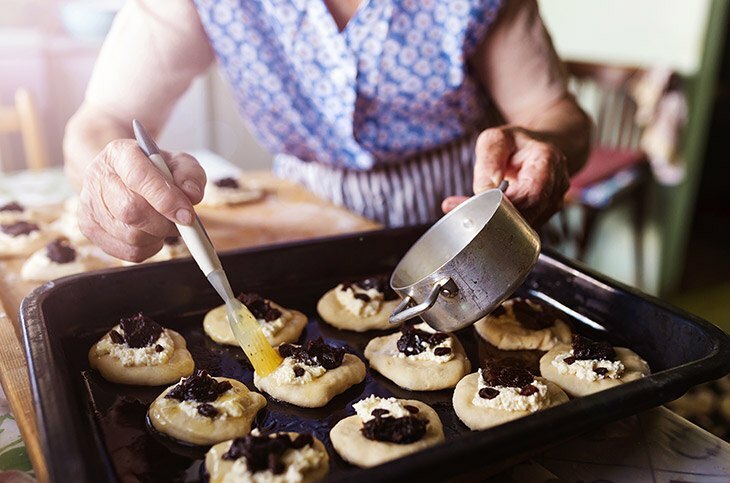 While waiting for the oven to get hot to the desired temperature, prepare the biscuits for the oven. Line the baking sheet with parchment paper. For consistent heating, put your biscuits in a single layer with enough room in between. Now using your pastry brush, glaze your biscuits with melted butter. 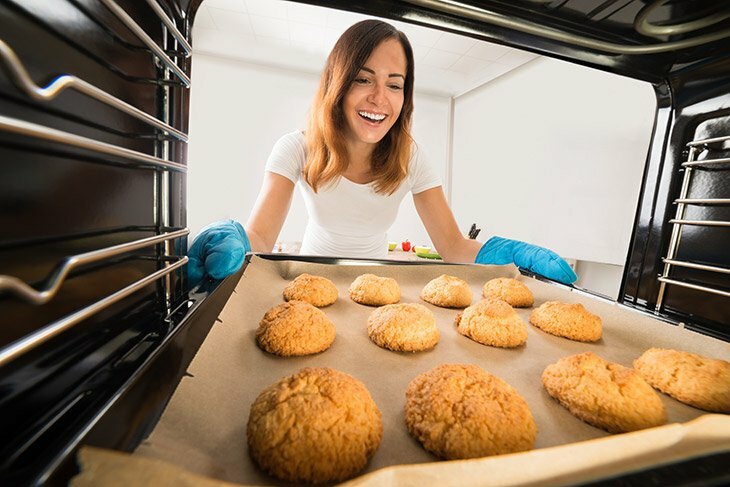 As your oven reaches the desired temperature, put the baking sheet of biscuits in the oven. 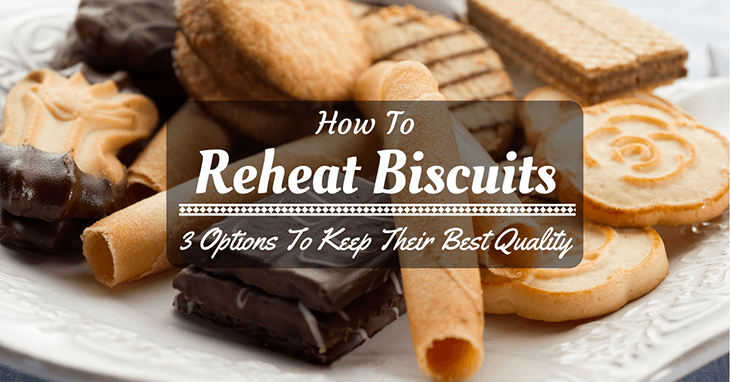 If your biscuits are straight from the fridge, reheat for 6-8 minutes. For frozen biscuits, reheat for 15-20 minutes. Once done, take the biscuits from the oven and enjoy. If you choose stovetop, then you’ll need a skillet to warm your cold biscuits. Although you can use any pans, I prefer the cast iron skillet because it can give a good sear to your food. So if you want your biscuits to have that nice textured crust then this skillet is a good choice. 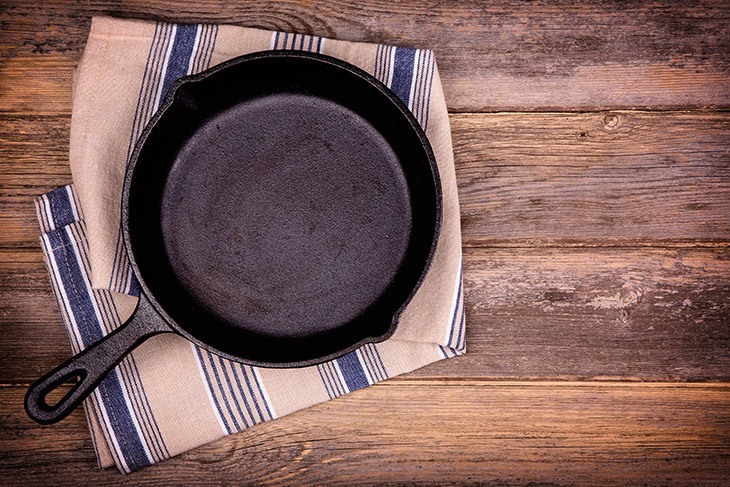 To prevent yourself the hassle of seasoning a cast iron skillet, try buying a pre-seasoned item, like this one. If you have no cast iron skillet, you can use any nonstick pan available in your kitchen. To flip the biscuits on both sides, you may need a spatula that’s either made of wood or nylon. If you’re trying to use a plastic spatula, be sure that it’s BPA-free to be safe from chemicals leaching into your food. If all you have is a metal spatula, be sure not to scrape the surface of your pan too hard or you’ll end up scratching it. Over low heat, preheat your skillet for about 10 minutes. To spread the heat more evenly, you may want to rotate the skillet occasionally. While waiting for the skillet to get hot, brush some melted butter onto the biscuits. Set aside. Once your skillet is hot, put in some of the melted butter and stir around with a spatula. Now put enough biscuits onto the pan. Be sure not to overcrowd the pan or you’ll have inconsistent results. Warm each side of the biscuits for about a 30-60 seconds. After you have reheated all the biscuits, serve and enjoy. You’ll need a microwave-safe container for your biscuits in the microwave. 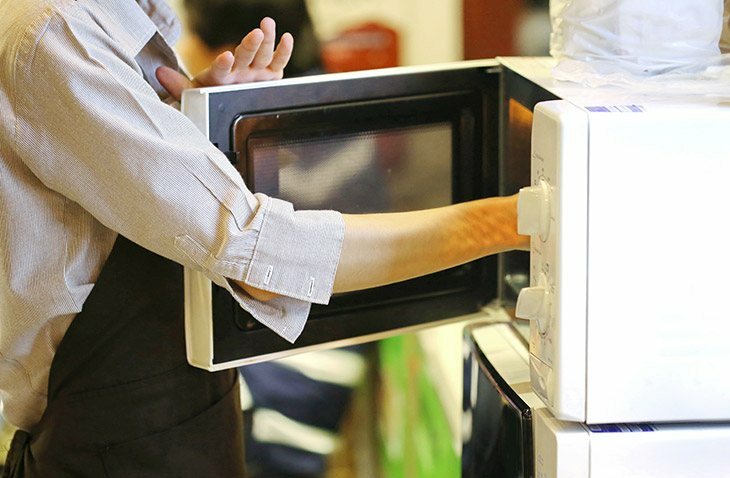 You can use any container as long as it’s microwave-safe. To make sure that all biscuits are warmed evenly, choose a plate or any shallow container. To make sure that your biscuits aren’t over dried, you’ll need to cover them with a dampened paper towel. To dampen your paper towel, spray some water in a spritz bottle. You can use any regular towel if you have no paper towels available. Place the biscuits in a microwave-safe container. Glaze the top with some melted butter with a pastry brush. Next, cover them with a dampened paper towel to keep the biscuits from over drying. Set the microwave to medium setting, and warm the biscuits for about 20-30 seconds. Once done, take the biscuits from the microwave and enjoy while hot. You can try wrapping the biscuits in tin foil when reheating in the oven. This can restore their tender-crisp selves effectively. When reheating biscuits in the skillet, try rotating them to distribute heat evenly and prevent any cold spots. You can try putting a mug of water inside the microwave to keep the biscuits moist when reheated. Did you enjoy learning how to reheat biscuits? You have three options: the oven, microwave, or stove-top. Thanks to these reheating options, I can restore the glory of my biscuits. Goodbye cold biscuit leftovers. If you’ve tried any of these options, tell us how it goes in the comments section. Please share this article with your friends and family if you like it.